Marassi Boulevard ... an artist’s impression. Eagle Hills Diyar marked further progress at Marassi Al Bahrain with the ground-breaking of its newest residential component, Marassi Boulevard. Marassi Al Bahrain is a distinguished urban project by Abu Dhabi-based Eagle Hills as part of a joint venture agreement with Diyar Al Muharraq, the developer of mega-project Diyar Al Muharraq. On completion, the project is set to become Bahrain’s premier ‘smart city’, offering luxury homes, high-end shopping, leisure and entertainment. The ground-breaking was held in the presence of Dr Maher Al Shaer, the managing director of Eagle Hills Diyar, Abdul Ghaffar Alkooheji, the managing director of Kooheji Contractors and other senior company officials. This comes following the awarding of the main construction contract to Kooheji Contractors. 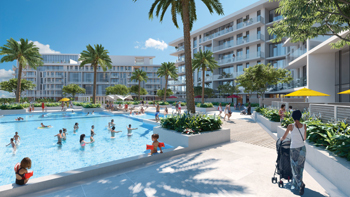 The property represents a residential mixed-use development featuring more than 240 studio, one-, two- and three-bedroom apartments, comprising a total area of 38,500 sq m.
Marassi Boulevard is located just a short walk from Marassi Al Bahrain’s main 2-km-long beachfront promenade. Bulgari Resort Dubai ...’urban oasis’. Situated on the exclusive, man-made Jumeirah Bay, the property is a true ‘urban oasis,’ for visitors and residents alike, says Meraas. 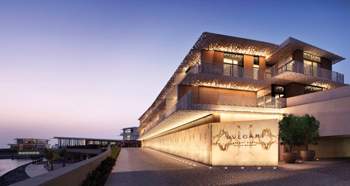 Comprising 101 rooms and suites, 20 private villas, a vast spa, the Il Ristorante – Niko Romito, and the world’s first Bulgari Marina and Yacht Club, the Bulgari Resort Dubai is set to become the destination of choice for visitors seeking the solitude of an island escape, the residential feeling of a private house and the comfort of being just minutes from the heart of the vibrant city and its cultural attractions, it states. The resort offers a full range of amenities, such as the gourmet Il Ristorante – Niko Romito, the Il Café open all day, Il Bar with its iconic oval-shaped freestanding bar and La Spiaggia, the exclusive beach club with private beach and a unique mosaic-design outdoor swimming pool. Areej 5 ... all 115 units sold. Arada, the UAE’s newest developer, says it has sold all the 115 apartment units within Areej 5 block in the first phase of Aljada, the largest mixed-use project in Sharjah, thus breaking the record for the sale of number of homes in the emirate on a single day. Aljada is situated on the last major plot of undeveloped land in the heart of Sharjah, with exceptional connectivity to surrounding areas, and is an all-encompassing district that comprises considerable retail, leisure and entertainment options, in addition to a wide range of residential and commercial offerings. The milestone came after Arada released Areej 5 to the market last month. At the record-breaking event, all 115 units, which included studios and one-bedroom apartments, got sold out on the same day, beating the 102 units sold on Aljada’s launch day. The record-breaking sales event follows recent updates at Aljada, including the signing of a partnership with Sharjah Electricity and Water Authority (Sewa) to power the 24 million-sq-ft masterplanned destination, and an agreement with Red Bull to host an exciting new motorsports event at the site on December 15. To be delivered in phases starting in 2019, construction on Aljada will begin in the first quarter of 2018 and the entire project is expected to be completed by 2025. The Aljada masterplan is carefully designed with walkability and wide green spaces in mind, allowing residents, workers and visitors the ability to live, work, play and be entertained within an all-inclusive and self-sustained precinct. UAE-based developer Omniyat has announced plans to open its 167-room luxury hotel, The Langham, Downtown Dubai, in Q3 of 2020. 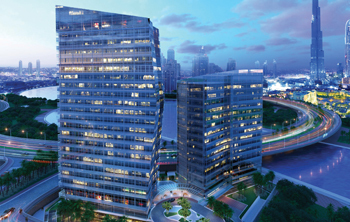 The hotel, to be managed by Langham Hospitality Group, will be located in the heart of the Marasi development on the banks of Dubai Canal. It is expected to open in time for Expo 2020 Dubai. Omniyat says it is offering eight per cent guaranteed return on the high-end apartments, indicating the developer’s confidence in the iconic brand and the project. Both the hotel and residences boast stunning views of the new marina on one side and the Burj Khalifa on the other. It will be a 167-room hotel with 239 fully-serviced luxury residences, ranging from one-, two- and three-bedroom suites to duplex penthouses. Andrew Jessop, the senior vice-president of Worldwide Development at Langham Hospitality Group, says: “The arrival of the Langham Hotels and Resorts brand in the Middle East establishes a new territory for us, and it happens to be one of the most evolving hospitality markets in the world. Damac Properties, a leading luxury real estate developer, has witnessed an overwhelming response from investors for its Vera Residences project located in Business Bay in Dubai, UAE, with more than 85 per cent of the units sold on the first day of sales. The luxury apartments, which boast breathtaking views of Dubai Canal, went on sale early last month (November). With prices starting from Dh499,000 ($135,827) onwards, investors snapped up apartment units in the 30-storey tower, which features elegantly appointed interiors and access to world-class amenities in an attractive and central location in Dubai, says Damac. Due to the high demand, only a limited number of units remain, says a top official. “The overwhelming demand we witnessed for our latest project Vera Residences reaffirms the success of our strategy to provide investors with the right product at the right price,” remarks Niall McLoughlin, the senior vice-president at Damac Properties. “By listening to what our existing and potential customers want and focusing on product innovation, we are able to present apartment units across a spectrum of prices based on design, amenities and, most importantly, location,” he notes. McLoughlin points out that the customers recognise good value and Vera Residences represents an ideal investment opportunity in one of the most desirable locations in the city, with high rental yields that can potentially reach 10 per cent per annum. “Thanks to our attractive payment plans, owning a home or investment property is now more attainable,” he states. Mamsha Al Saadiyat beachfront community ... under development. Abu Dhabi’s Tourism Development and Investment Company (TDIC) has released an additional building for sale at Mamsha Al Saadiyat, a beachfront community currently under development at Saadiyat Island. The master developer of major tourism, cultural and residential destinations in Abu Dhabi, TDIC says Azure offers investors and prospective homeowners a compelling opportunity to own prized real estate a short walking distance from the newly-opened cultural icon, Louvre Abu Dhabi. Azure holds 79 units in total, with 36 currently available across four-, three-, two- and one-bedroom units along with penthouse and loft options. Located along Saadiyat Island’s pristine shoreline, Mamsha Al Saadiyat redefines contemporary beachfront living, promising buyers residential units that are characterised by high-end finishes and panoramic views of the Arabian Gulf. Construction of the 461-unit Mamsha Al Saadiyat is ongoing and progressing on schedule, with concrete and structure works for all buildings now complete, says TDIC. The entire project comprises 414 apartments or lofts offering one to four bedrooms, 47 townhouses and nine premium duplex penthouses, each with five bedrooms, a private swimming pool and terrace.